Charles Willson Peale painted a portrait of General Greene from life in, which was then copied several times by C.W. Peale and his son, Rembrandt Peale. 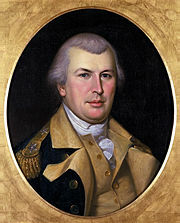 Nathanael Greene (August 7, 1742 – June 19, 1786) was a major general of the Continental Army in the American Revolutionary War. When the war began, Greene was a militia private, the lowest rank possible; he emerged from the war with a reputation as George Washington's most gifted and dependable officer. Greensboro, North Carolina, the third-largest city in the state, is named in his honor. Greene's legacy became part of the story of America expressed conceptually in terms of the "dream" that anyone, regardless of class, or any advantage provided by their family's social or economic status from birth, can achieve their highest aspirations, hopes and potential. Behind this dream, at its most noble, lies the ideal for which Greene, although raised as a pacifist, was prepared to fight, that of liberty and freedom. He was "determined to defend his "rights and maintain (his) freedom," even if he had to "sell" his "life in the attempt." Without the skill, commitment and sacrifice of men such as Greene, the nation of the free would not have defeated the British, against whom it rose up in revolt. The country that emerged as a result of the Continental Army's victory was founded on the human desire for freedom as a birthright, and for self-governance. The son of a Quaker farmer and smith, he was born at Potowomut in the township of Warwick, Rhode Island, on July 27, 1742 (O.S. )/May 27, 1742 (N.S.). Greene was the son of Nathanael Greene, Sr. and his second wife, Mary Motte. Though his father's religious community discouraged "literary accomplishments," Greene educated himself, with a special study of mathematics, history of military tactics and law. The Rev. Ezra Stiles, later president of Yale University, was a strong influence in the young Nathanael's life. In 1770, Greene moved to Coventry, Rhode Island, to take charge of the family-owned forge (foundry), shortly prior to his father's death. There, he was the first to urge the establishment of a public school and in the same year he was chosen as a member of the Rhode Island General Assembly, to which he was re-elected in 1771, 1772, and 1775. It is debatable that he was a member of the General Assembly since there is no mention of his participation in his personal papers and because there were several of his contemporaries with the same name from Rhode Island. He sympathized strongly with the "Whig," or Patriot, element among the colonists. On July 20, 1774, he married Catharine Littlefield Greene of Block Island. "Caty," as she was known by friends, had been living in East Greenwich with her aunt and uncle since her mother died when she was ten years old. Her uncle was a Whig Party leader and governor of Rhode Island. Her aunt and namesake, Catherine Ray, was a close friend and correspondent of Benjamin Franklin from 1751-1784. In August 1774, Greene helped organize a local militia, which was chartered as the Kentish Guards in October. His participation in the group was challenged because he had a slight limp. It was at this time, he began to acquire many expensive volumes on military tactics, and began to teach himself the art of war. In December 1774 he was on a committee appointed by the assembly to revise the militia laws. It has been speculated that his zeal in attending to military duty led to his expulsion from the Quakers. However, his separation from the Society of Friends was more gradual and actually began with his marriage to Caty. At this time, marriage to a non-Quaker was grounds for expulsion. On May 8, 1775, he was promoted from private to Brigadier General of the Rhode Island Army of Observation formed in response to the siege of Boston. He was appointed a brigadier of the Continental Army by the Continental Congress on June 22, 1775. Washington assigned Greene the command of the city of Boston after it was evacuated by Howe in March 1776. Greene's letters of October 1775 and January 1776 to Samuel Ward, then a delegate from Rhode Island to the Continental Congress, favored a declaration of independence. On August 9, 1776, he was promoted to be one of the four new major generals and was put in command of the Continental Army troops on Long Island; he chose the place for fortifications, and built the redoubts and entrenchments of Fort Putnam (the site of current day Fort Greene) east of Brooklyn Heights. Severe illness prevented him from taking part in the Battle of Long Island. Greene was prominent among those who advised a retreat from New York and the burning of the city so that the British might not use it. He was placed in command of Fort Lee on the New Jersey side of the Hudson River. On October 25, 1776, he succeeded General Israel Putnam in command of Fort Washington, across the river from Fort Lee. He received orders from Washington to defend Fort Washington to the last extremity, and on October 11, 1776, the Congress passed a resolution to the same effect; but later Washington wrote to him to use his own discretion. Greene ordered Colonel Magaw, who was in immediate command, to defend the place until he should hear from him again, and reinforced it to meet General Howe's attack. Nevertheless, the blame for the losses of Forts Washington and Lee was put upon Greene, but apparently without him losing the confidence of Washington, who himself assumed the responsibility. At the urgent request of Washington on March 2, 1778, at Valley Forge, he accepted the office of Quartermaster General. His conduct in this difficult office, of which Washington heartily approved, has been characterized as "as good as was possible under the circumstances of that fluctuating uncertain force." However, he had become Quartermaster General on the understanding that he should retain the right to command troops in the field. Thus we find him at the head of the right wing at Monmouth on June 28, 1778. In August, Greene and Lafayette commanded the land forces sent to Rhode Island to co-operate with the French admiral d'Estaing, in an expedition (the Battle of Rhode Island) which proved unsuccessful. In June 1780, Greene was in command at the Battle of Springfield. In August, he resigned the office of Quartermaster General after a long and bitter struggle with Congress over the interference in army administration by the Treasury Board and by commissions appointed by Congress. Greene had vehemently argued with Congress over how to supply the Continental Army. Congress was in favor of having the individual states provide equipment, which had already proven to be ineffective since the federal government held little to no power over the states. A month before Washington appointed him commander of West Point, it fell to Greene to preside over the court which, on September 29, 1781, condemned Major John André to death. André was hanged in Tappen, New York on October 2, 1871. Mount Vernon, home of George Washington, depicted on a US stamp of 1936. With its color and its inclusion of Nathanael Greene as well as Washington, this arguably qualifies as a government issue "Greene Stamp". The Congress had been unfortunate in the selection of commanders in the South. It had chosen Robert Howe, and he had lost Savannah. It had chosen Benjamin Lincoln, and he had lost Charleston. In the summer of 1780, near Camden, South Carolina, on August 16, the British attacked Horatio Gates' army, which broke and ran in wild confusion. This left the way clear for Cornwallis to pursue his goals of gathering southern Loyalists and taking the war to Virginia. He planned then to use his southern ports to move men and material into the interior of North and South Carolina. When Gates' successor was to be chosen the Congress decided to entrust the choice to Washington. On October 5 it resolved "that the Commander-in-Chief be and is hereby directed to appoint an officer to command the southern army, in the room of Major General Gates." Washington delayed not at all in making his selection. On the day after he received a copy of the resolution, he wrote to Nathanael Greene at West Point, "It is my wish to appoint You." 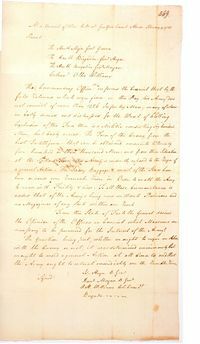 The Congress approved the appointment, gave Greene command over all troops from Delaware to Georgia with extraordinarily full powers, "subject to the control of the Commander-in-Chief." Greene took command at Charlotte, North Carolina on December 2. Brig. Gen. Isaac Huger of the South Carolina Continentals was appointed his second in command. The army was weak and badly equipped and was opposed by a superior force under Cornwallis. Greene decided to divide his own troops, thus forcing the division of the British as well, and creating the possibility of a strategic interplay of forces. This strategy led to General Daniel Morgan's victory of Cowpens on January 17, 1781, where nearly nine-tenths of the entire British force were killed or captured, after the battle had initially seemed hopeless for the American forces. With over 800 prisoners Morgan began a strategic retreat, moving north towards Salisbury where he was joined by Greene at Cowan's Ford on the Catawba River. Greene then wrote to Huger to direct his troop movement to Guilford Couthouse. Arriving on February 9 at Guilford, Greene summoned his field officers to a council of war of his chief officers and put forward the question of whether the army should give battle. It was voted that for the time being, the army should continue retreating to gather more forces, and defer engagement with Cornwallis. On the tenth he writes to Patrick Henry requesting troops, "If it is possible for you to call forth fifteen hundred Volunteers & march them immediately to my assistance, the British Army will be exposed to a very critical & dangerous situation." Greene at this same time formed a special light corps to be commanded by Col. Otho Williams to cover the main army’s retreat. In a letter to George Washington on February 9, he described the "light army" he had formed under Williams as composed of: "cavalry of the 1st and 3rd Regiments and the Legion amounting to 240, a detachment of 280 Infantry under Lieut. Col. Howard, the Infantry of Lieut. Col. Lee's Legion and 60 Virginia Riflemen making in their whole 700 men which will be ordered with the Militia to harass the enemy in their advance, check their progress and if possible give us opportunity to retire without general action." Also saying "I called a Council, who unanimously advised to avoid an action, and to retire beyond the Roanoke immediately. A copy of the proceedings I have the honor to inclose." The re-united army only numbered two thousand and thirty-six men, including fourteen hundred and 26 regulars. Col. Edward Carrington joined the command, with the report that boats had been secured, and secreted along the Dan River in Virginia, so as to be collected on a few hours' warning. The British army was at Salem, only 25 miles (40 km)from Guilford. This was on the tenth of February. By the fourteenth, Greene's army had outrun the British and crossed the Dan River at Irvine's and Boyd's ferries in Halifax County, Virginia. Cornwallis got the news in the course of the evening. The river was too high to cross without boats, and every boat was on the farther shore. Greene had won the race. "This American retreat, which extended across the breadth of North Carolina, is considered one of the masterful military achievements of all time." After only a week's encampment at Halifax Court House, Greene had sufficient promises and reports of help on the way to recross the river. Greene and the main army re-crossed the Dan River into North Carolina on February 22. Greene then pursued Cornwallis and gave battle on March 15, 1781, at the Battle of Guilford Court House in North Carolina, on ground he had himself chosen. Greene was defeated, but inflicted a great loss of men to Cornwallis. Three days after this battle, Cornwallis withdrew toward Wilmington. Greene's generalship and judgment were again conspicuously illustrated in the next few weeks, in which he allowed Cornwallis to march north to Virginia and himself turned swiftly to the reconquest of the inner country of South Carolina. This he achieved by the end of June, in spite of a reverse sustained at Lord Rawdon's hands at Hobkirk's Hill (two miles (three km) north of Camden) on April 25. From May 22-June 19, 1781 Greene led the Siege of Ninety-Six. These actions helped force the British to the coast. Greene then gave his forces a six weeks rest on the High Hills of the Santee River, and on September 8, with 2,600 men, engaged the British under Lieutenant Colonel Alexander Stewart at Eutaw Springs. Americans who fell in this battle were immortalized by American author Philip Freneau in his 1781 poem "To the Memory of Brave Americans." The battle, although tactically a draw, so weakened the British that they withdrew to Charleston, where Greene penned them during the remaining months of the war. Greene's Southern Campaign showed remarkable strategic features. He excelled in dividing, eluding and tiring his opponent by long marches, and in actual conflict forcing him to pay heavily for a temporary advantage a price that he could not afford. He was greatly assisted by able subordinates, including the Polish engineer, Tadeusz Kościuszko, the brilliant cavalry officers, Henry ("Light-Horse Harry") Lee and William Washington, and the partisan leaders, Thomas Sumter, Andrew Pickens, Elijah Clarke, and Francis Marion. North and South Carolina and Georgia voted Greene liberal grants of lands and money, including an estate, "Boone's Barony," south of Edisto in Bamberg County. This he sold to meet bills for the rations of his Southern army. After twice refusing the post of Secretary of War, Greene settled in 1785 on his Georgia estate, "Mulberry Grove," 14 miles (23 km) above Savannah. He died on the estate on June 19, 1786, at the age of 44, presumably of sunstroke. A monument (under which his remains are interred) to Greene stands in Johnson Square in Savannah (1829). His statue, with that of Roger Williams, represents the state of Rhode Island in the National Hall of Statuary in the Capitol at Washington; in the same city there is a bronze equestrian statue of him by Henry Kirke Brown at the center of Stanton Park. There is a statue of Greene standing, sculpted by Lewis Iselin, Jr. in front of the Philadelphia Museum of Art. He is also memorialized by an equestrian statue designed by Francis H. Packard at the site of the Battle of Guilford Courthouse near what is now Greensboro, North Carolina, the city named after him. Greeneville, Tennessee is also named after him. In 2006, the city of Greenville, South Carolina, also named for him, unveiled a statue of Greene designed by T. J. Dixon and James Nelson at the corner of South Main and Broad Streets. Greene was singularly able and, like other prominent generals on the American side, a self-trained soldier. He was second only to Washington among the officers of the American army in military ability, and the only general, other than Washington, to serve the entire eight years of the war. Like Washington, he had the great gift of using small means to the utmost advantage. His attitude towards the British was humane and even kindly: he even generously defended Gates, who had repeatedly intrigued against him, when Gates's conduct of the campaign in the South was criticized. ↑ Terry Golway, Washington's General: Nathanael Greene and the Triumph of the American Revolution (New York: Holt, 2005), 12. ↑ The Prizery, The Crossing of the Dan, "The Race to the Dan" begins Retrieved October 15, 2007. ↑ Nathanael Greene, The Papers of General Nathanael Greene, ed. Dennis M. Conrad (Columbia, S.C.: Model Editions Partnership, 1999), The Papers of General Nathanael Greene Retrieved October 15, 2007. Greene, George W. The Life of Nathanael Greene, Major-General in the Army of the Revolution. 3 vols. New York: Putnam, 1867-1871. ISBN 0-8369-6910-3. Greene, Nathanael. The Papers of General Nathanael Greene. Edited by Dennis M. Conrad, Columbia, S.C.: Model Editions Partnership, 1999. The Papers of General Nathanael Greene Retrieved October 15, 2007. The Prizery. The Crossing of the Dan. "The Race to the Dan" begins Retrieved October 15, 2007. A letter from Nathanael Green with his acceptance of command over the Southern Army from the Papers of the Continental Congress.